What are two component regulatory systems? 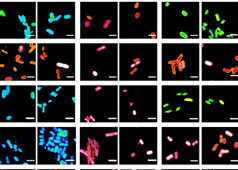 Bacteria respond to changing environments by altering gene expression. Two-component regulatory systems (TCRS) are important mediators of signal transduction that enable bacteria to detect physical and/or chemical changes and then relay this signal through the cytoplasm to the bacterial nucleoid, where modulation of gene expression occurs. 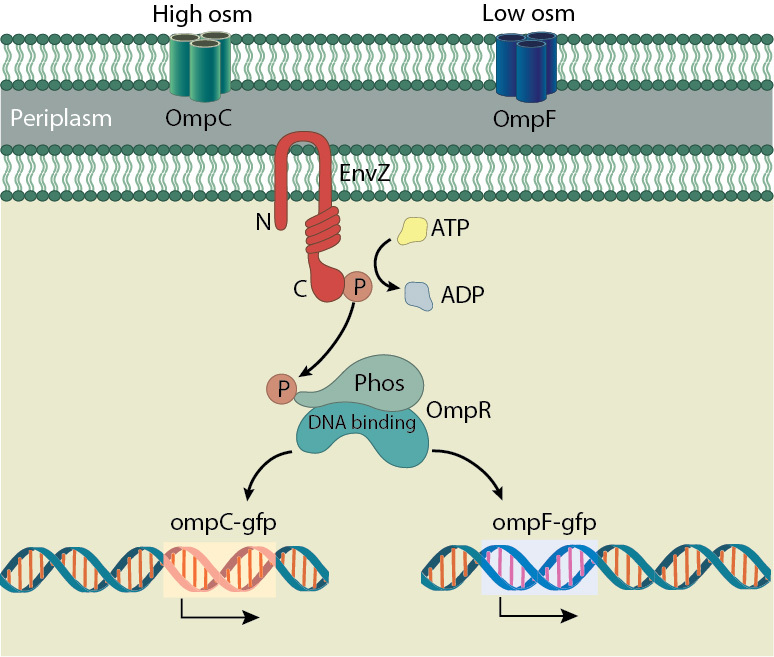 EnvZ is a histidine kinase that senses changes in medium osmolarity and signals its response regulator OmpR to bind to OmpF and OmpC porin promoters to differentially modulate their transcription. In its most basic form, a TCRS consists of a membrane-bound sensor kinase and a DNA-binding response regulator. In response to specific stimuli, the sensor kinase is phosphorylated at a conserved histidine residue and then the phosphoryl group is transferred to the conserved aspartate on the response regulator. Phosphorylation of the response regulator triggers a conformational change, driving dimerization and high affinity DNA binding. For example, EnvZ is a sensor kinase that spans the inner cytoplasmic membrane and has two domains- a sensory domain and a transmitter domain. In response to osmotic changes, EnvZ is phosphorylated at a conserved histidine residue and then the phosphoryl group is transferred to the conserved aspartate on the response regulator, OmpR (see Figure 1). Phosphorylation of OmpR triggers a conformational change, driving dimerization and high affinity DNA binding. Bacteria differ from eukaryotes in that their signal transduction systems employ histidine phosphorylation rather than tyrosine phosphorylation . The two component TCRS SsrA-SsrB in Salmonella contributes to virulence by de-repressing the H-NS mediated silencing of SPI-2 genes. Both PhoQ/PhoP and EnvZ/OmpR regulate SsrA-SsrB. 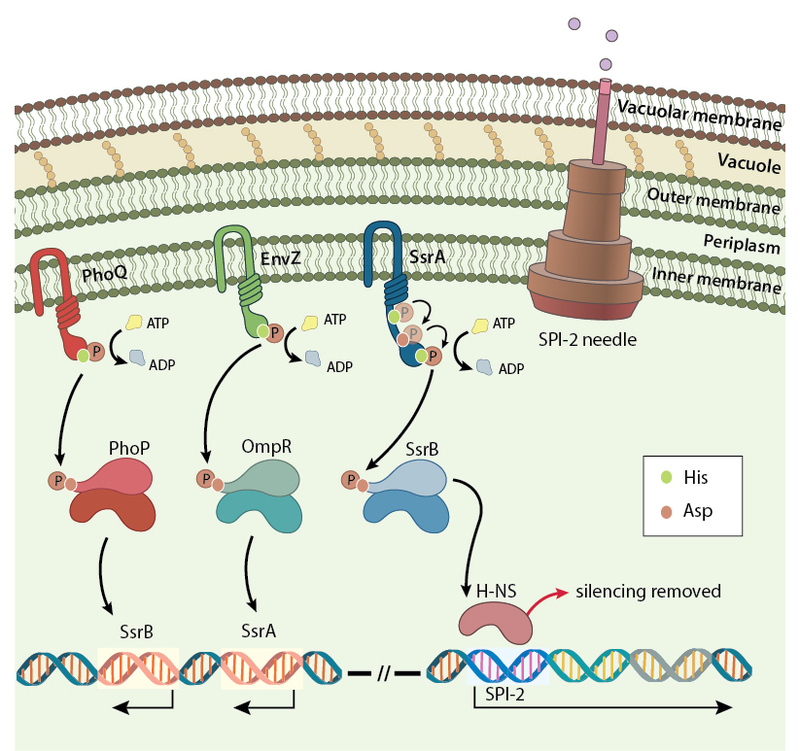 The underlying mechanism of regulation of SPI-2 by SsrA/SSrB is the phopho-relay between the sensor kinase, SsrA, and the response regulator, SsrB. SsrA is a tri-partite sensor kinase that is likely phosporylated at His405, followed by transfer of the phosphoryl group intramolecularly between Asp739 and His867. The phosphoryl group is finally transferred to Asp56 in the N-terminus of SsrB. Phosphorylated SsrB relieves the repression of SPI-2 genes by H-NS. While many two-component systems control basic cellular processes such as motility, nutrient uptake and cell division, bacterial pathogens use two-component systems to control virulence. A prominent example is the gram-negative pathogen Salmonella Typhimurium, which is a frequent cause of bacterial gastroenteritis. 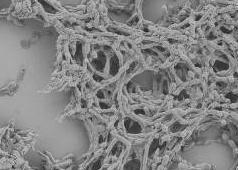 After ingestion of contaminated food, Salmonella can travel to the lower intestinal tract where it crosses the intestinal epithelium and is engulfed by resident macrophages. The low acidity and low osmolality of the macrophage vacuolar environment serves as an activating signal for various two-component systems, including: EnvZ/OmpR, PhoP/PhoQ, SsrA/SsrB, which enables the pathogen to survive inside host cells. The PhoP/PhoQ TCRS responds to changes in the level of cations like Ca2+ and Mg2+, whereas EnvZ-OmpR, the master regulator, responds to changes in the acidic environment of the macrophage . Both PhoQ/PhoP  and EnvZ/OmpR ,  regulate SsrA/SsrB which eventually regulates SPI-2 expression and secretion of effectors (Figure 2). In particular, the SsrA sensor kinase is activated by low pH and phosphorylates the response regulator SsrB. Phosphorylated SsrB de-represses H-NS silencing and activates a set of virulence genes located at the Salmonella Pathogenicity island-2 (SPI-2) region , . These genes encode various components of a molecular syringe (Type-III secretion system) which allows the delivery of ~30 specialized effector proteins that manipulate the host cellular machinery to ensure the survival and proliferation of intracellular Salmonella. What is the role of septins in infection? Host (human) septins play a role in bacterial pathogenesis and in host defense mechanisms, mainly, autophagy. Although actin is the most commonly exploited cytoskeletal protein by many bacterial pathogens, septins, which are unique cytoskeletal components, are also found to co-localize with actin at sites of infection. The exact role of septins at these sites are not clear, but it is likely that septins may act as a scaffold for the recruitment and assembly of other proteins involved in infection, or provide additional rigidity to the actin structures triggered by the bacterial pathogens. Read more..
What are bacterial two component regulatory systems? Two-component regulatory systems (TCRS) are important mediators of signal transduction that enable bacteria to detect physical and/or chemical changes and then relay this signal through the cytoplasm to the bacterial nucleoid, where modulation of gene expression occurs. This allows bacteria to respond to changing environments by altering gene expression. Read more..
How are actin pedestals formed by bacteria? EPEC and EHEC employ Type III secretion systems (T3SS) to inject translocated intimin receptor Tir into the host. Tir has a loop-like structure and inserts itself into the host plasma membrane with both the C- and N-termini facing the cytoplasm. The loop region is exposed to the extracellular space and binds the bacterial A/E protein intimin. The interaction between Tir and intimin anchors the bacterium to the host membrane. Read more..
Actin pedestals are raised actin structures formed by the dynamic polymerization of host actin, induced by effector proteins secreted by extracellular pathogens like Enteropathogenic Escherichia coli (EPEC) and Enterohaemorrhagic Escherichia coli (EHEC). Read more..
What are actin comet tails? Actin comet tails are actin structures formed by the dynamic polymerization of actin beneath some species of intracellular bacteria belonging to the genus Listeria, Shigella, Ricketssia, Mycobacterium and Burkholderia. Read more..
How do bacteria modulate the host cytoskeleton? Some bacterial pathogens gain entry and subvert immune detection by surviving intracellularly. Others remain extracellular, but manipulate host pathways from outside. A common strategy employed by both these pathogens is to modulate or subvert the host cellular machinery, by facilitating cytoskeletal rearrangements. Read more..
What is the mechanical basis for pathogenesis of diseases such as cancers and microbial infections? Pathogenesis is defined as the origination and development of a disease. Insights into disease etiology and progression, the two major aspects of pathogenesis, are paramount in the prevention, management and treatment of various diseases. Read more..
What are the key components of cell signaling? What are the similarities and differences in molecular mechanisms underlying the response to acid and osmotic stress in Salmonella and E.coli? How do the bacteria Salmonellae decide between the virulent lifestyle in macrophages and carrier state in gall bladder biofilms?